Once apon a time, this baker was not eating dairy at all, for months and months. In this period of time, Easter passed. I was much younger, and of course you can’t pass Easter without chocolate. For a child – or certain adults I know *cough* Mrs Chisholm – it would be a crime! However, I was also stubborn. I didn’t like dark chocolate much, but found a new love in After Eights or Fry’s peppermint chocolate bars. The feeling of being able to eat chocolate after so long without it…amazing! Now this inspired today’s creation, though this treat is just a little bit more calorific. I promise I’ll post some healthier recipes soon readers 😉 my sweet tooth gets the better of me sometimes! A gorgeous mixture of chocolate (milk and dark), biscuits, mini marshmallows and Aero mint bubbles. Its stupidly delicious, and way too moreish. No baking required, just some melting and stirring – a perfect recipe to get kids involved in. Also perfect snack to keep kids happy! Oh, and another bit of good news – I lost 2lbs 🙂 Since starting this diet 3 weeks ago, I’ve lost 8lb. So far, so good! 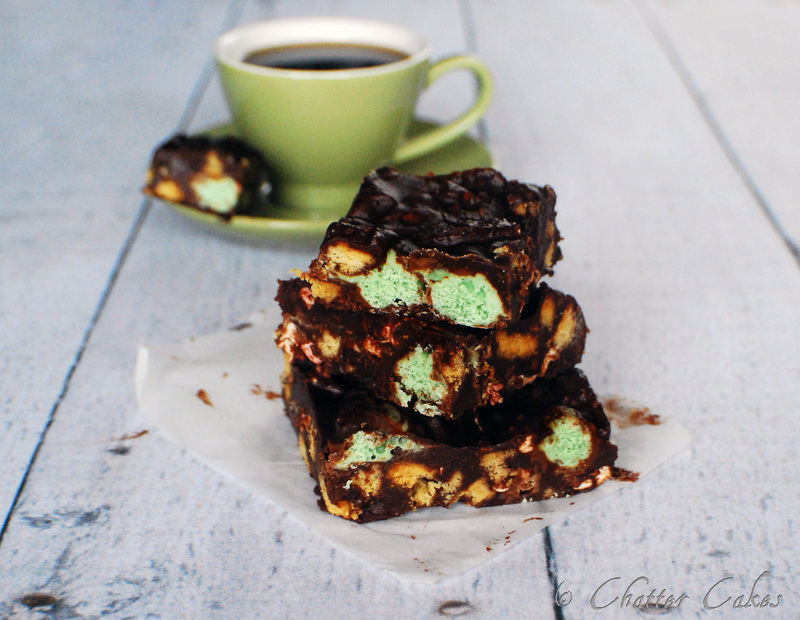 I’d like the recipe for your mint chocolate fridge cake please. Tiny marshmallows, as many as you want to put in! You need to line a square dish or tin with baking paper before starting. I’d recommend a 8″ tin, or something similar. 1) Melt the butter, syrup and chocolate together in a bowl, over a simmering pan of water. Once all melted and combined, put to the side to cool for around 5 minutes. 2) Bash up the biscuits in any way you find suitable – I put them all in a sealed bag and used a rolling pin! Put into a separate bowl, and pour the cooled chocolate mixture over the top and mix. Then add the aero bubbles and marshmallows to taste. I’d suggest you don’t stir this too much, or the bubbles might start to melt, and you will lose a bit of the round green effect when you cut into it. 3) Pour mixture into prepared tin and even it out as much as possible. Put into fridge, and let it cool for an hour or so.